No, I didn't eat KFC. That's just crazy. Kidding aside, this food diary is hard work, people! Having to lug my camera around all day is something I'm used to. 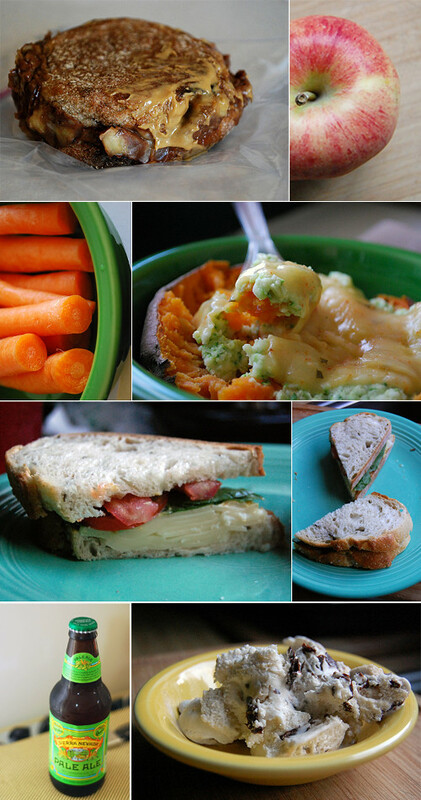 Taking photos of certain foods I eat is something I'm used to. But EVERYTHING? I mean, how many photos can I take of apples and carrots? I've definitely hit my threshold. But, I still have a couple more days left showing you all what I eat. What I've gained most from this little adventure is awareness. I'll take away a heightened awareness of how much I need to eat versus how much I want to eat. Distinguishing between the two is difficult. Here's the day in pictures . . .
BREAKFAST: Banana scramble sandwich (with 1 tablespoon of peanut butter mixed into the banana) with peanut butter. 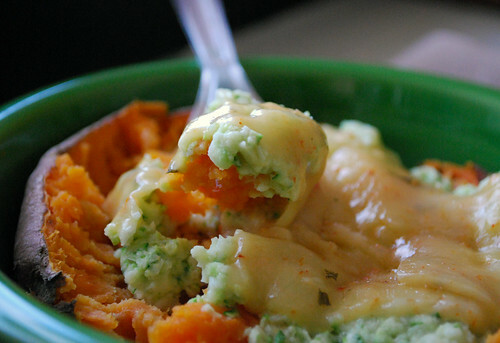 LUNCH: Microwaved sweet potato with zucchini mash and cheese. PRE-DINNER: Sierra Nevada Pale Ale. DINNER: Swiss, spinach, tomato, and mustard on toasted rosemary salt bread. DESSERT: Coconut ice cream -- the best kind -- with cookie dough in it. Overall, I'm happy with what I ate and the energy it gave me to power through the day (which included a HOT commute to/from work via bike). We waited until almost 8PM to eat dinner, though, and by then my stomach was screaming for BREAD. So, that's just what we got. Not the best kind to munch on -- the whitest of the white. However, a nice treat. 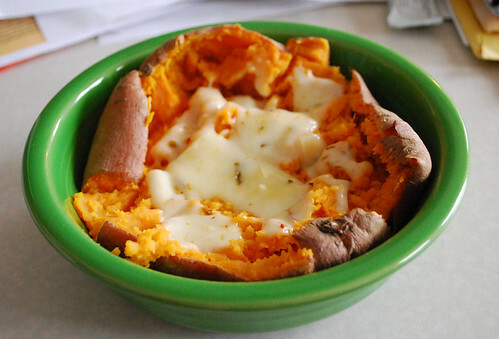 Everyone's been asking about these microwave sweet potatoes. 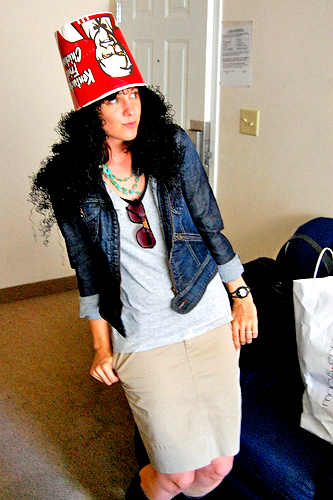 I got the idea from Katie over at Healthy Tipping Point. 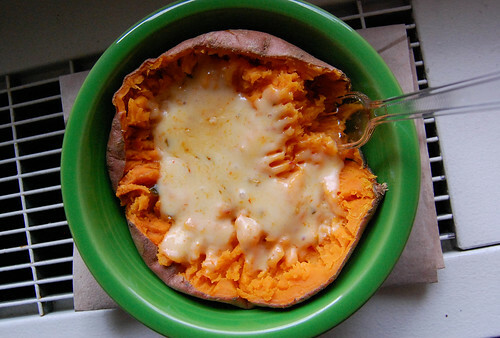 She described the microwave sweet potato as the "ultimate healthy travel food." And since I'm basically eating an on-the-go lunch every day I'm at work, this translates into the ultimate work food, too. It's easy, really. Just scrub a medium sweet potato to get all the grime off. Stab it with a fork or knife a few times to allow the steam to escape. Then set on a microwave safe dish (plate of some sort) and microwave on high for between 5 and 6 minutes. When the time is up, carefully remove from the microwave, slice in half, and mash. I've made this very thing for lunch for days now. Just look! I like to cover mine with a healthy serving of pepper-jack cheese. And yesterday I even topped it with a zucchini concoction that was simply 1/2 a zucchini processed with 1 tablespoon tahini (I made it before work). Then I topped it with the cheese, put back in the microwave for another minute or so, and enjoyed a "loaded" healthy-comfort food lunch made at lightening speed. What else can you do with microwaved sweet potatoes? You'll have to check back later today to find out! While you wait, I'd love to hear what you're favorite on-the-go lunch is. Do you have something so incredibly irresistible, healthy, and sustaining that you just simply can't go without it? Let us know! Just leave a comment or email us at neverhomemaker [at] gmail [dot] com. Also, don't forget to enter our giveaway. You could win a $50 shopping spree at iHerb.com! And if you'd like to get caught up on the life of my stomach, check out Day 1, Day 2, Day 3, Day 4, Day 5, and Day 6.